Just in time for the Christmas holiday sales, Creative launched the PCI-E Sound blaster and you can enjoy X-Fi Fidelity audio via PCI-E using your PC desktop. It is designed to make music and movies sound way better. PCI-E is already getting common in all the latest motherboards and there are fewer which still supports PCI slots. This new PCI-E sound blaster will be a welcoming news to gamers. Few months ago, we already knew that there are already some OEM PCI-E X-Fi sound blaster in the market for quite some time. This new launch, however, had made it official. 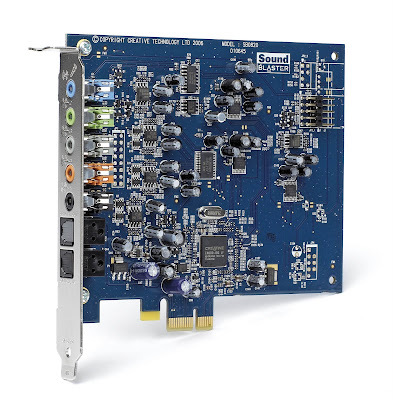 SINGAPORE – 5 November, 2007 – Creative Technology Ltd., a worldwide leader in digital entertainment products, today announced the PCI Express (PCIe) Sound Blaster X-Fi® Xtreme Audio card that is designed to make music and movies sound way better. It features the awardwinning X-Fi Xtreme FidelityÔ audio technologies which enhance audio playback and deliver virtual surround sound effects. The Creative PCIe Sound Blaster X-Fi Xtreme Audio will be available in end November at The CREATIVE Stores at Marina Square, Plaza Singapura and International Business Park, the online store at sg.store.creative.com, as well as major retail outlets in Singapore, at a suggested retail price of S$119.00 (US$69.99). “We are excited to introduce the first PCI Express Sound Blaster for the desktop PC, continuing our legacy as the de facto audio standard for PC digital entertainment,” said Steve Erickson, Vice President of Audio for Creative. The Creative PCIe Sound Blaster X-Fi Xtreme Audio features two fundamental audio technologies to help improve the overall audio experience for users. The X-Fi Crystalizer revitalizes downloaded music and movies, restoring the details and vibrance lost during compression. This X-Fi technology intelligently enhances musical dynamics by emphasising sharp percussive sounds and transients, creating a “punchier” and livelier listening experience. The X-Fi CMSS-3D function allows users to expand their stereo music and movies into surround sound. To the listener, voices would appear to originate from the centre and ambient sound appears all around, similar to the listening experience in a live performance. The headphone surround effects will sound like multi-channel speakers positioned all around the listener. Listeners will feel as though they are surrounded by multiple virtual speakers, sitting with their favourite band or as if they have the best seats in the movie theatre. Gamers enjoy full realistic sound effects with the Creative PCIe Sound Blaster X-Fi Xtreme Audio. Games sound superb with positional audio that is so accurate gamers can locate their enemies by sound. EAX® ADVANCED HD™ 4.0 sound effects allow gamers to elevate their gaming experience to the next level. It also comes with Creative ALchemy software that allows Windows Vista™ users to enjoy legacy DirectSound 3D games. This software will detect the presence of a number of top PC games, converting the games’ DS3D and EAX calls into OpenAL calls, allowing gamers to enjoy these titles in full, multi-channel sound with hardware effects. The Creative PCIe Sound Blaster X-Fi Xtreme Audio will be available in end November at The CREATIVE Stores at Marina Square, Plaza Singapura and International Business Park, the online store at sg.store.creative.com, as well as major retail outlets in Singapore, at a suggested retail price of S$119.00 (US$69.99). For more information about the Creative PCIe Sound Blaster X-Fi Xtreme Audio and X-Fi Xtreme Fidelity, please visit www.asia.creative.com. Please register for a free login to access the downloads @ myCreative Fansite Forum (Member Area) Thanks!